John Eustis’s booming baritone rang out immediately after Brian Attix hit a towering drive from the second tee. The ball sailed rightward toward the third fairway, during the recent final match of the Shawnee Country Club golf league for the 2004 season. 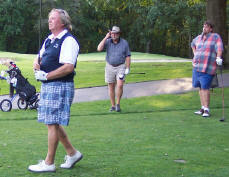 Cape Region golfer Rick Markel (left) watches his tee shot on the 7th hole during the final matches of the Shawnee Country Club golf league’s 2004 season. Also observing the ball’s flight are John Eustis (center) and Brian Attix (right). Eustis had asked me to play as a substitute in his team match against Attix and Cape Region golfer Rick Markel. He was forced to shout the same warning three more times on the same tee, as each of us quickly followed Attix’s example, to varying degrees. Eustis’s yelling reminded Cape Region golfer Rick Markel of a story he once heard from a talented senior golfer with significant tournament experience. Apparently some players will shout “Fore!” even when their drive presents no threat to anyone. 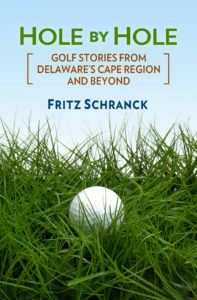 The idea is that the sudden shouts might disturb another competitor’s putt or swing somewhere else on the course, leading to a critical extra stroke or two. We laughed and quickly agreed that this tactic reflected a startling level of gamesmanship, and then went looking for our tee shots. Markel’s comment made me think about the kinds of semi-sporting maneuvers used by the 52 competitors playing in the 13 other matches that evening. None of our foursome did anything quite as creative as shouting after every hit, but we certainly engaged in some of the standard banter and teasing that usually occurs among Shawnee’s members. In fact, among the several dozen regulars in the Shawnee golf league, the opportunity for camaraderie and competition was the leading reason why they enjoyed participating in the six-month long series. Gardner Shugart is the president of Shawnee and the person who first started the league four years ago. “It’s really a fun thing. The number of participants has grown each year. The first half of this year, we had eight teams playing on Monday, with twenty more teams playing on Tuesday. For the second half of the season, we had two divisions of 14 teams each, all playing on Tuesdays.” The core group of 56 players is supplemented by several other golfers, thanks to a liberal substitution policy. Steve Van Sant is the golf coach for Lake Forest High School. He had a great attitude about the league play. “Who cares how you do? It’s fun. Then again, I used to be competitive,” Van Sant grinned. The final night’s competition concluded with a steak dinner, prizes for all players, and a lot of laughs. In case you’re curious, I beat Attix 3-2, Markel beat Eustis 2-1, and we tied for the team point. Pretty close match, eh?